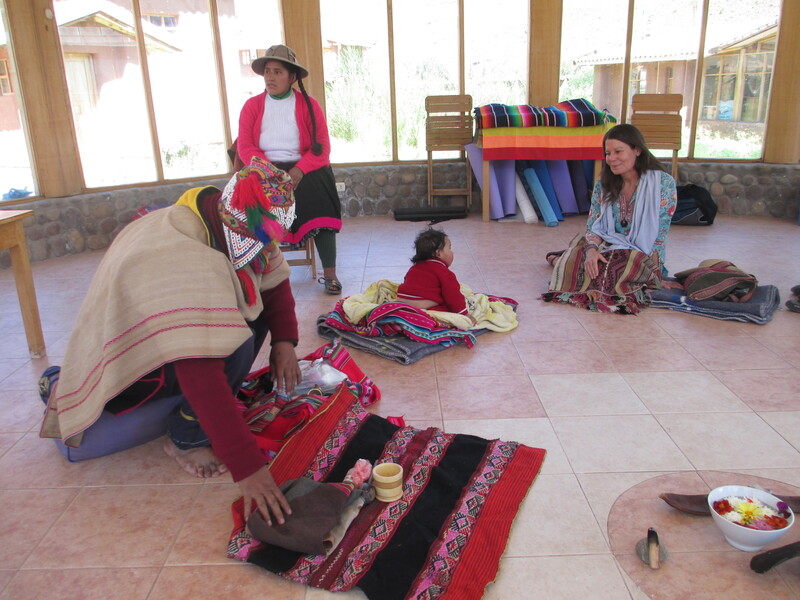 Several guests here, at Paz y Luz Conference Center in Pisac, Peru, were given a rare opportunity to become honorary family members and take part in a Shaman’s own family rite honoring his granddaughter, little seven-month-old, Sofia. This Despacho is as formal and as involved as a Baptism and welcomes the newest member to the world with symbolic offerings of flowers, Coca leaves, food, sweets, seeds, incense…even Frankincense…..spices, and xerox copies of U.S. $100 bills. Many elaborate steps and words in Quechua, the language of the Peruvian Andean people, went into the making of a beautiful parcel. 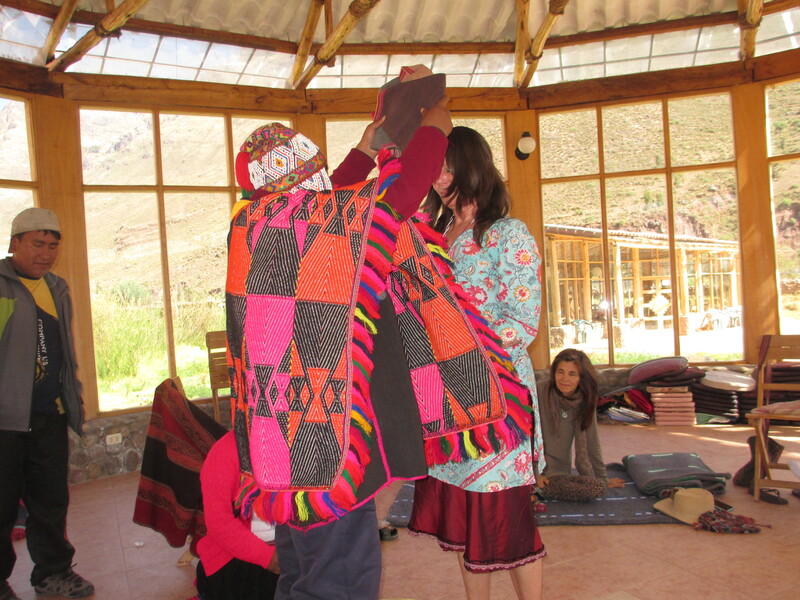 We, circling participants, thrice, came in front of the shaman; first, kneeling and offering our five Coca leaves, into which we had breathed our intentions for Pachymama, Mother Earth; and our wishes for all of her people. Next, we took turns cutting small tufts from Sofia’s hair and putting those dark strands into a bowl of flowers, along with a donation of Peruvian Soles. 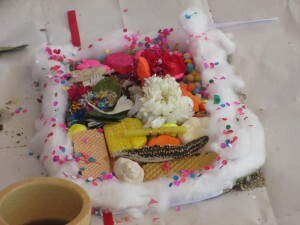 Finally, we again took turns standing, front and center, to allow the shaman to cleanse our body, front and back, with the newly-blessed packet of symbolic offerings. 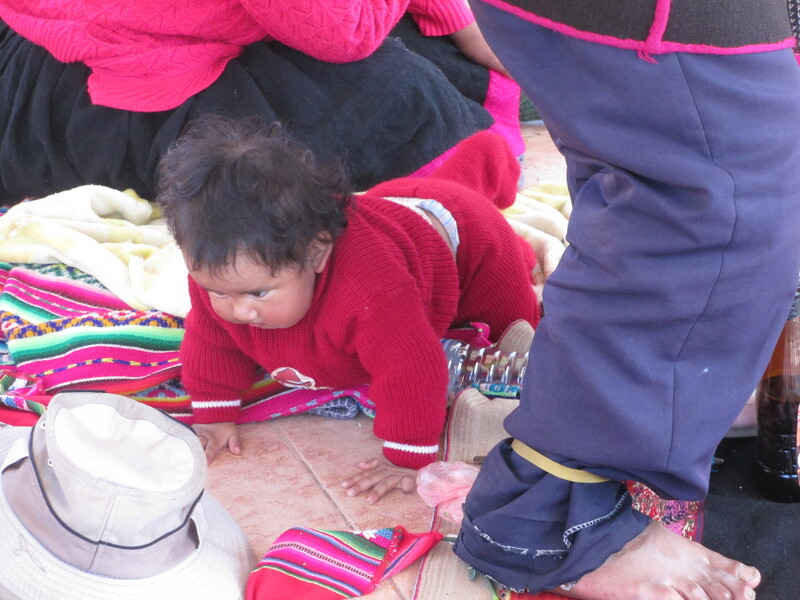 The baby was mighty cheerful during the long ceremony and seemed to understand that she was at the center of the attention. Still, it was a test of calmness, which she sailed through; aided by a little bit of breast-feeding. Her father, Santo, speaks both Spanish and English and translated the Quechua of his shaman father. 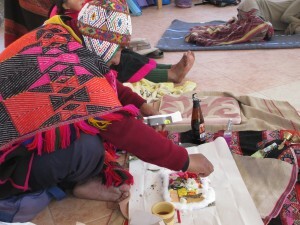 They are the Quero People, who live at an altitude of 12,000 feet in the mountains near Cusco and some of their elders have never left the heights and entered present-day civilization. To reach their village, requires a six-hour drive and then a four-hour walk up steep inclines. After the ceremony, everyone was invited to partake of a wonderful lunch in the Paz y Luz restaurant, consisting of a whole trout for each of us, rice, cooked vegetables, rice pudding and Key Lime Pie. Not a small gesture by this beautiful family. By sharing this important day with them, we are now all accepted as their family. I will present them with the photographic record taken during the ceremony. During lunch, I met three American women who are devoting their lives to the well-being of the Quero People, by providing a Health Clinic and Junior High and High School, so that students can qualify for college for the first time. This coming weekend, I’ll be taking part in a CondorVision Ceremonial Weekend, during which plant medicine in the form of San Pedro, will be used to (perhaps) induce visions. 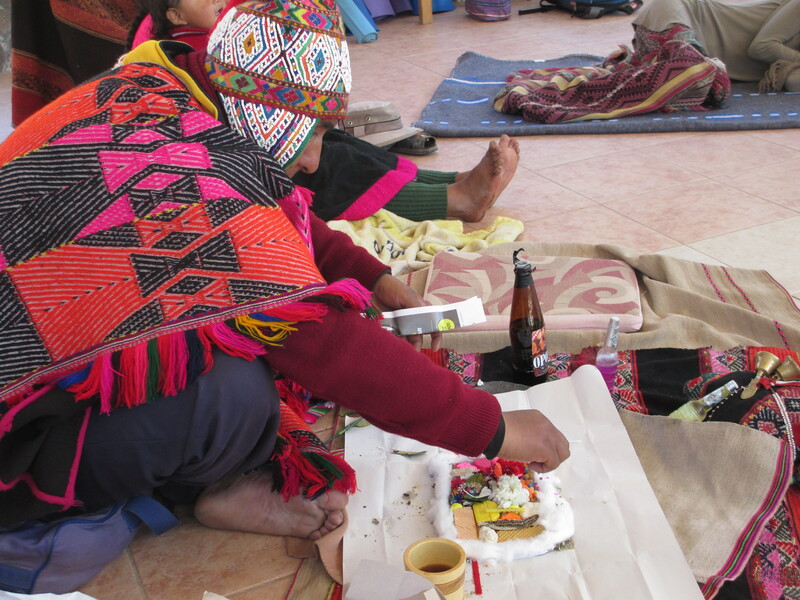 The small doses of the herb will be, at the very least, a cleansing purgative; but hopefully, will induce a vision as satisfying as the one I had in an Ayahuasca Ceremony here five years ago. As I am taking part in the ancient ways, I’m also trying to learn modern uses of my own photography….. as in, adding them to my blogs. I’m not very good at it yet, but I have a patient teacher here, Joe Khoury, himself a shaman-in-training; who shows me how to manage a function in Pixlr and then leaves me to apply that one lesson to my piles of waiting pictures: wash/rinse/repeat. Little by little, I get better at it. Maybe, when I leave The Sacred Valley, I will really know what I’m doing?